This is the story of an extraordinary man, or rather the beginning of the story of an extraordinary man. Although he has been dead some 50 years, additional information, amazingly, continues to emerge to this day. This account reiterates the main events in his life but focuses principally on trying to draw out the depths of this truly intriguing character. For example, it includes extensive personal tributes from his contemporaries collected in the 12 months after his burial and not published before. It concludes with some directions a more assiduous historian might care to pursue at some future date. and was a tall upright man still with a spring in his stride. Initially somewhat taciturn, he would open up when questioned about his early career as a runner which dramatically recalled the first two decades of the 20th century. I used to sit next to him on coach-trips to matches and encouraged him to ramble but foolishly did not record any of this until after his death in 1965. Only then I appreciated his athletic achievements and the modest claim that he has to be remembered not just among the athletic fraternity but as a man of his time in Halesowen and its environs. The centenary of the 1908 London Olympic Games came and went with barely a ripple, but the 2012 Games revived memories – in particular, the marathon race, with its dramatic ending and the definitive finishing photograph that remains etched on the retina of sports fans. Jack Price could well have been the hero of that encounter, but circumstances turned him into a bit player. What follows though is the stuff of folk-lore and legend. Jack Price was born in Neen Savage, in Shropshire, in 1884. After leaving school he became a labourer, but the work was poorly paid. At 17 he gathered his belongings together and trudged all day into Halesowen, some 40 miles distant, where he had heard of good wages to be found in the local steel-works. Penniless and hungry, he was offered a night`s lodgings by a kind Salvationist and was to stay in the town for the rest of his life. Initially he found some work on the pipeline being laid from Radnorshire to Birmingham but later was employed at the Stewarts & Lloyds steel-works, where he was to spend the rest of his working life. Working alongside Jack was a Mr Malcolm Glaze, and it was he who in 1904 persuaded Jack to enter a walking race from Halesowen to the Land Oak public house at Kidderminster and back, covering some 20 miles. At the hostelry in Kidderminster Jack was only 13th, but he used his natural strength to such effect, particularly up the tough Hagley Hill, to overhaul the field and finish 1st. His prize was a suit of clothes worth £2 10 shillings (£2.50), which was a handsome prize in those days. Thus began a momentous athletics career and the makings of a local legend. Jack was equally successful in his first running race, a seven-mile event nearby in Cradley, and for a couple of years he competed in most local sports meetings. The longest event was invariably the one mile handicap, and that was a distance not suited to his loping style; So he enjoyed indifferent success, but the real turning-point came in 1906 when he joined Small Heath Harriers. It was not uncommon in those days for clubs to have off-shoots and Small Heath had a branch at Cradley Heath and later at the Birmingham Street Chapel in Halesowen. The effect on Jack of joining a strong club was dramatic. He finished 5th in the National Cross Country Championships that year and was selected to represent his country in the international match at Newport. He finished 6th in that race and was part of the victorious England team. By now he was a familiar figure training up and down the lanes of Halesowen after a hard day`s work at the foundry in Coombs Wood. In “The Halesowen Story”, written by Hans and Lena Schwarz and published by H. Parkes Ltd in 1956, the following anecdote is recorded: “Jack worked with Benny Buck, who was very proud of his new bike. Jack threw out a challenge, `Benny, I could lick you on that bike’. So they had a race, with Benny on his bike and Jack on foot, from Halesowen to Bromsgrove, but coming up the Hagley Hill on the way home Benny had to get off and by the time he had finished the course Jack had already had his bath”. The authors also record that once while Jack was out training on a similar occasion another local character, Kicking Ted, drew alongside him in his horse-and-cart. `Want a lift, Jack?’ he enquired. `No thanks’, Jack tersely replied, `I`m in a hurry!’. During these formative years Jack married and started a family, and then in distance races in the two years prior to the 1908 Olympic Games in London he built a formidable reputation and was greatly feared. He needed little persuasion, therefore, to enter the Midlands marathon trial to be run from Coventry to West Bromwich, which was a distance of 25½ miles plus final laps of the track. Everyone was tipping W.H. Day (“Dido” Day), of Birchfield Harriers, but after a brisk 10 miles reached in 58.33 Price pulled away steadily and reached the West Bromwich Albion football Ground over 18 minutes ahead of his illustrious rival in 2 hours 37 minutes and 13 seconds. A newspaper report of the time commented: “Price, above all things, is a stayer. Of pace and dash, as usually understood on the running path, he has little or none, while he is almost destitute of style. At the Olympic Games much will depend upon what kind of course is selected for the marathon event if Price is to be seen at his best. The harder and more exhausting it is, the better he will show up, for it is in a question of pace in the last few miles he may find his stamina no match for those who can command pace also”. As a result of the Midlands trial Jack Price was automatically selected as one of Britain`s 12 representatives for the Olympic marathon to be held from Windsor to the White City Stadium. Little did anyone of them conceive of the drama that was about to unfold, and in the athletic world this race is best remembered for two reasons. Firstly, the 25-mile run from Windsor was extended by one mile 385 yards to finish in front of the Royal Box at the White City and this thereafter became the standard distance for a marathon. Secondly, there is the Dorando Pietri affair. Price had led the race for over half the distance but succumbed to the heat and relentless pace he set himself and eventually dropped out. If he had run his normal cautious race there is no doubt he would have made the podium as a medallist if not the victor. The Italian, Pietri, was modestly positioned but as opponents disappeared he found himself in the lead. He fell several times from exhaustion and was eventually helped over the line by officials. The photograph is an iconic sporting memory. Naturally, Pietri was disqualified, but his courage was rewarded by a special trophy urged on officials by the Royal family and, reportedly, by none other than Sir Arthur Conan Doyle. and posing for the camera. “I am convinced to this day that at least six of the 12 British runners could have knocked 15 minutes off the time of Dorando (2hr 54min 46sec). Why did they fail? I can give an explanation in three words: lack of experience. At that time our longest organised race was 10 miles. The Midland Marathon trial took place in May 1908, from Coventry to the West Bromwich Albion Ground, with one mile on the track to make up the distance. I covered the first 10 miles in 58 minutes and the second 10 in 59 minutes. At 25 miles I was five seconds outside George Dunning`s world record and, had I known, could easily have been inside. For this performance I was given a special gold medal by the late Mr Harry Butler. When I finished the race on the Albion Ground I had recorded 2hrs 37mins 13secs and was 18 minutes in front of the second man – no less a light than W.H. (better known as `Dido’) Day. This time was more than 17 minutes faster than Dorando achieved and was accomplished over a much stiffer course for it included a climb up Hamstead Hill. Why didn`t I do it in the Olympic race? Well, on that occasion I was running to instructions. Just before the race Mr W.W. Alexander, that great Birchfielder whose name is perpetuated by the sports arena bearing his name, and Lord Desborough impressed on me not to let Tom Longboat, the famous Canadian, break away. Longboat was a mixture of Irish, Canadian and Indian blood. He had been brought to Ireland six weeks before the race and the Press reported that in training he had beaten everything, including trotting ponies etc, that had been put up against him and that in the Olympic race he would get close to 2hrs 30mins. Yes, I covered Longboat all right but in doing so brought about my own downfall and that of others. My time for the first three miles was just over 15 minutes and only madmen would attempt such a start. In the Midland marathon I had clocked 58 minutes for 10 miles; in the Olympic race I recorded 56 minutes by running to orders, and at 14 miles had `lost my legs’”. Price was not the only one to succumb to the hot weather and fast pace, Longboat subsequently went the same way. As the race took its toll it was inevitable that a then relative unknown would win the title, and that fell to the American, John Hayes, after the Pietri disqualification. Price headed home a very disappointed person and nursed a grievance against himself for a couple of years before turning professional and taking on the best in the world. His first race was the Powderhall Marathon, in Edinburgh, and he won in 2 hours 40 minutes and 7 seconds, some 14 minutes quicker than Pietri had run in the Olympics. Now he was into the professional world with a vengeance and continued to win many prestigious races and even set a world record for 15 miles. A man of strong moral conviction, he never got involved with the betting that went on, but he did win enough cash prizes to set himself up a home comfortably with his wife, son and daughter in Halesowen. His running career terminated with the First World War. He volunteered and experienced action with the 27th Siege Battery Royal Garrison Artillery (1915-1919) in many crucial engagements in France and Flanders. Some 29 of the battery lost their lives and over 300 were wounded in some of the worst battles of that war. Yet whenever and wherever he could Jack trained and boxed. Throughout he dreamt of starting up a running club in his beloved Halesowen, and in December 1922 he persuaded three young men to accompany him on a cross-country run. So a club was born that was to be a sub-section of the famous Birchfield Harriers for some 20 years before it became the independent Halesowen club of today. One of the three men who ran with him initially was the great Eddie Webster, who went on to record many wins over the country and on the track and was the International Cross Country Championships winner in 1925. Jack coached both him and several others to the highest levels in the sport and continued his close association with the club until his death in 1965. He was a truly inspirational figure. Jack died in Hayley Green Hospital in November 1965. The service was held at the tiny St Kenelm`s Church on the side of Clent Hill in Halesowen. The cortege that preceded via the Manor Abbey Ground after circling the track twice. The ceremony was very moving, and afterwards I was one of the group that returned to the Manor Abbey, changed and ran silently over the beautiful hills that Jack had loved so much. Somehow it seemed the right thing to do, and there is no better way of understanding Jack Price than listening to his contemporaries speaking half-a-century ago in the year following his death. I collected these reminiscences, which were all hand-written or typed by the individuals themselves. “I knew Jack Price over a period of 40 years and first met him when I joined Halesowen Athletic Club to keep fit for football. His powerful personality and the fact that long-distance running came fairly easy to me soon lured me away from football to running and was the beginning of a long association with Jack which ended at Hayley Green Hospital the night before he died. He was still the same old Jack on that occasion, very grateful for the attention he was receiving and as keenly interested in the club`s affairs as ever. “His methods of training were never the middle-of-the-road stuff. He went to the extreme in everything. I remember that the tincture of iodine that was used a lot in those days for wounds and bruises was never strong enough for Jack and he used to get extra strong black stuff for his own use. The same applied to embrocation which he made up himself and bestowed liberally on his athletes, much to the annoyance of their lady friends and themselves when it started to bite. “The bath water at the Bethel Mission where we trained was never hot enough for Jack and after a training session, which included a run with members and taking two classes in exercises which he did himself, he would pour the already used bath water back into the geyser almost bring it to the boil and soak in it. On one occasion the caretaker thought it was rather quiet and on investigating found Jack had clocked out in the bath. This time he had got the water too hot even for his tough constitution. “We used to go for walks with him every Sunday morning over the Clent and Walton Hills and very often he would produce a bottle of very strong laxative, which was a mixture of liquorice, and insist we all had some, with the result that most of the party had to retire behind some convenient hedge during the walk. He told me he was a consumptive suspect in his early life, which made him determined to get as much fresh air as possible. “Economic circumstances forced him to work in front of the furnaces, which was very hard and hot, but he never succumbed to the drinking habits of most of his colleagues and was satisfied with the barley water that was supplied. I never heard Jack swear, although he could express his annoyance very forcibly when the occasion required it. He was very highly thought of by management and workers and had almost become a legend. One of the stories was about the morning when the streets were covered with ice due to frozen rain and Jack was one of the few to arrive on time. He had put on a pair of old socks over his boots and run to work. “The combination of Eddie Webster and Jack Price was well known on all the sports grounds around the country. Here you had the dedicated man allied to the high-spirited youth who would obey Jack`s instructions as regards training but was naturally attracted to the bright lights and easier way of life and being a very popular figure had plenty of chances to indulge in these pleasures. However, such was the force of Jack`s personality that I never heard Eddie complain about the rigorous training that was imposed. They were often training on the Clent Hills together, which comprised personal combat such as boxing, wrestling etc, with Eddie having to frequently cry ‘enough’ as Jack was at that time very tough indeed. “Considering that Jack had not had any educational background, his oratory was remarkable. He could make a good speech in his acquired Halesowen accent without any kind of notes, marshalling his facts instinctively in their correct order. It was amazing how he kept his enthusiasm for athletics in his latter years. He would talk about present-day athletes and their races with as much knowledge as any members of the club. “Although I was not keen on marathon running, he persuaded me to enter a race at the end of the track season in 1929 at Bolton. I finished 3rd and Jack seized this opportunity to press me into entering the Polytechnic Marathon the following May. On the Friday week before the race Bert McDonald, ex-AAA mile champion, came to ask me if I would run in a 15-mile invitation road race at Glasgow which was to be held in conjunction with the Queen`s Birthday Sports at Firhill Park, and at which Eddie Webster, himself, and other prominent athletes were competing. I explained that I had been training with Jack for the Polytechnic, but Bert offered to go out with me and see if Jack would agree to me going. Jack did not fancy the idea of racing the Monday before the Polytechnic but agreed it was a chance not to be missed. “We travelled to Glasgow on Saturday night and again I finished 3rd. Jack was unable to go to London for the Polytechnic, but I received a letter from him before I went which so impressed my father that he kept it for many years. The letter explained how I as a comparative novice should run the race and insisted that I had a chance to win. As events turned out, the race followed the pattern much as predicted. Jack’s shrewdness was a byword among athletes of that period and many sought his advice. Note that Stan Smith won that 1930 Polytechnic Marathon in 2:41:55 and represented England in the British Empire Games in Canada later that year. .
“I first heard about Jack Price when my father used to talk about his long-distance running exploits together with his religious fervour 40-50 years ago. Although at that time I was mainly interested in ball-games, I started running to keep fit and joined Birchfield Harriers. I first met Jack in 1925 at a British Legion Sports when I finished 3rd in the mile to Tommy Smith and Cyril James, both of whom were trained by Jack and were two of the original members of Halesowen Athletic Club. “At the sports meeting the next year, 1926, the townspeople presented Eddie Webster with a writing-bureau and a piano for his great athletic performances. He also competed at the meeting and after winning two races he ran from scratch in the one mile and finished 2nd to myself who ran off 120 yards. Jack always maintained that this was Eddie`s fastest mile considering it was an eight-lap mile and my time was 4.15. After the race Jack asked me to join up with the crowd, and being very impressed by his personality, together with all the other stories I had heard about him, I jumped at the chance. “The greatest impression he made on me was his complete dedication to long-distance running and the time and thought he put into the sport almost to the exclusion of his family life. He obviously enjoyed running himself and was indeed a great competitor, even to the extent of running us younger members into the ground if he was feeling particularly good on the day. Once he had decided you had the potential he would almost insidiously talk about what races you would win if you followed his instructions, and one felt he had an almost hypnotic effect. I am sure it was this kind of influence he had over Eddie Webster, for I don`t think Eddie would have achieved anything like the success he did without Jack Price. “I think that probably Eddie Webster was Jack`s greatest achievement inasmuch that he cajoled, advised and completely took charge of this young man and moulded him into one of the finest running personalities it has been my pleasure to know. Eddie`s record speaks for itself, but I imagine he was rather difficult to discipline for he was an extrovert and very fond of the good things of life. Jack, I think, was one of the very few people who could have handled him. “As Jack was a professional runner I only saw him compete once in a two-mile race at Cleobury Mortimer (near his birth-place) when he came in 2nd. He was in his middle 40s at the time and had a rather loping style, and he appeared to me to run mostly on his strength, looking quite distressed after a few laps. In the winter of 1926/27, although I was playing fairly good soccer, he kidded me to run a bit of cross-country and I was lucky enough to get into the Birchfield winning team for the Midland Junior. If six Halesowen boys had counted in the race they would have won it on their own. Actually, I hated every minute of it, but such was Jack`s influence I ran more for him than for Birchfield. “In the early days Jack was a prominent member of the Halesowen Bethel Mission and whenever he gave an address it was almost like a royal command and we all turned up and marvelled at his rhetorical flow. I never had the impression that Jack was a deeply religious man although he regularly attended Church and Chapel and was, in my opinion, a very good man. When Jack realised I was not up to his standard on the running-track he still permanently remained very interested in me and, in fact, persuaded me to play football for one of his works teams. It was on his proposition that I became the rather young chairman of the Halesowen Athletic Club in 1933, but when I became president in 1942 and proposed a break- away from Birchfield he was not at all happy about it. I know he persuaded one or two members not to take the plunge, but I think he really thought it was in the best interests of those concerned. Jack was always more interested in individual performance than team success. When the club began to get settled down and the Manor Abbey Ground came into being, Jack seemed to take a little more interest, but I feel he was never again the dynamic figure he had been in the 1930s”. “I first met Jack in 1907 through athletics. At that time he was running at Cradley Heath where Small Heath Harriers had a branch. A club was formed in Halesowen in 1907 by the young men at Birmingham Street Chapel. I joined with several others, and a few months later we were strong enough to start a Small Heath branch at Halesowen. We had a very good club for some years. “Jack had to do a lot of hard training to get fit and keep fit. With most of us it was just the opposite, with the result that while we were running across a field he ran around it. He thrived on hard work. He had a long stride, with his body leaning slightly forward, and he made good use of his arms and shoulders. He was a slow starter and had to do a few miles before he could get going. This was alright in long distance but bad in short distance”. “I got to know Jack Price in 1932 when I joined the athletic club. Not only myself but all the other youngsters worshipped him, and. I think that at the time we would have done anything within our power for him. Not all people have the same ability to be successful athletes, but Jack always gave good advice to everybody. He was always clean in thought, word and deed. Up to the outbreak of the war Jack used to run cross-country training packs on Saturday afternoons and go in for long walks on Sunday mornings over Clent and Walton Hills. These walks were looked forward to and enjoyed by everyone. “Jack`s competitive days were over, but he was a very strong runner over the country. I have heard him say that he used to train behind the lines when he was in France during the 1914-18 War, and that he was so fit then that he thought he could stand a blow in the solar plexus from a sledge-hammer, but he could not get anyone to perform this action! He would have the boxing-gloves on with anyone, including men only half his age During the economic depression most men worked on short time, and Jack and Eddie Webster spent days at a time running up and down hills. “There is only one way to describe Jack. He was a fine man, clean, honest and fearless.. He had a certain amount of intellectual ability and a good brain. He could make a good speech and I think that if he had had the benefit of a good education he could have succeeded at a number of things. I do not think that there was only one influence in his life, and apart from the club there was religion, although he never rammed that down anyone`s throat in my experience of him”. “I knew Jack, who was an old and very honoured acquaintance of my father, in the 1920s when I was running for the Birmingham University cross-country team and I sometimes trained with the Halesowen crowd during the holidays. It was to Jack’s interest and training advice that I owed much of what modest success I had as an athlete. I remember especially the interest and encouragement he showed not only to star performers such as Eddie Webster (one of the idols of my youth) but also to the humblest rank and file. These were the desperate days of the slump and many an unemployed young man owed the maintenance of his self-respect to Jack`s inspiring and often repeated gospel that running was the sport par excellence for both rich and poor. “The accounts of Jack Price hold him in universal awe, and rightly so, but the picture would be incomplete without reference to other characteristics,. He was, after all, human. He could at times be distant, intimidating and didn`t suffer fools gladly. In coaching terms he demanded the highest commitment and loyalty but reciprocated in similar fashion. He was in many ways a perfectionist, a man who could focus totally on goals. These demands were too much for some athletes who leant towards more liberal structures. He was deeply religious and a fearsome preacher. He generously laced his `muscular christianity’ with homespun principles about abstinence. His hero was Eric Liddell, the great Olympic sprinter and missionary who was one of the key figures portrayed later in the film ‘Chariots of Fire’. A more infinitely complex character than first met the eye, he never set out to be loved but respected. Somehow he managed both”. The story continues and what remains to be found? 1. Jack Price competed on numerous occasions, some of which he even forgot himself! It must be possible to trace and list these competitions, particularly those that were professional head-to-heads. Also details about his opponents with whom he became life-long friends. See Alex Wilson’s account of Jack’s marathon races in this issue of “Track Stats”. 2. There exists some background information on his birthplace and formative years in Nene Savage that begs exploration. 3. There will be similar information somewhere on the gruelling work in the steel-mill where he spent most of his working life. 4. There is a mass of information about the 1908 Olympic marathon, including photographs, that would enhance the account given here. 5. Jack`s war record shows that he was at some of the most savage encounters of that bloody period, and this would flesh out his personality. 6. As a coach his most successful protégé was Eddie Webster. A full account of his life would be helpful, starting with that provided by the historian of Birchfield Harriers, Wilf Morgan, and related in the April 2000 issue of “Track Stats”..
7. No description of Price would be complete without reference to his deep christian beliefs and his Bethel Mission connection (see, for example, “The History of Halesowen”, by Julian Hunt, Phillimore, 2004). Acknowledgements: these are numerous but particular thanks go to Jack Price`s grandson, Michael Whitehouse, and to the athletics historian, Alex Wilson. There have been numerous accounts of the memorable 1908 Olympic marathon, and the most recent books include “The Marathon Makers”, by John Bryant, John Blake Publishing, 2008; “The 1908 Olympics”, by Keith Baker, SportsBooks Ltd, 2008; and “At Last He Comes: The Greatest Race in History”, by Norman Harris, AuthorHouse Ltd, 2013. Editor’s note: Charles Gains is president of Liverpool Pembroke & Sefton Harriers AC. This article originally appeared in “Track Stats”, edited by Bob Phillips, the quarterly journal of the National Union of Track Statisticians, www.nuts.org.uk. Jack Price was a decorated cross-country runner before he took up marathon running in 1908. He had twice represented England in the International Cross Country Championship and shown himself to be one of those runners who could rise to the big occasion. In 1906 he was on the winning team when he was 6th on his debut at Haydock Heath, after finishing only 7th in the National. The following year he just missed out on a team gold medal in Glasgow, where he came in 10th after finishing in 8th place in the National. His 1908 cross-country campaign had begun promisingly enough with a 3rd in the Midland Junior Championship and a 4th in the Midland Senior, but then it had stalled when he had an off-day in the National at Newbury. When the first of a series of marathon trials for the upcoming Olympic Games in London was decided at Warburton on 21 March 1908, suddenly the event was all the talk in amateur distance-running circles. Any distance-runner worth his salt – and there were many – wanted to be on that team and to represent his country on the world’s biggest stage. Given that the longest track race at the Olympics was only five miles, which was a distance well below his best, Price decided to try his hand at ths “new” event. He entered what was expected to be the main qualifier, the “Polytechnic Harriers Marathon Trial Race”, to be run on 25 April over a large part of the proposed route for the Olympic marathon. However, he missed his train and arrived at Windsor too late for the start. But he would have another chance to impress the selectors – namely, in the “25 Miles Midland Marathon Road Race” on 9 May. And impress them he did, winning by over 18 minutes in a stupendous time of 2:37:13. “Price’s claims to a place in the English team”, wrote the “Birmingham Post“, “can scarcely be overlooked after his magnificent performance, which is little worse than the 25 miles track record”; Indeed, shortly afterwards, he was one of the 12 runners to be appointed to the British Olympic marathon team. However, as mentioned by Charles Gains in his excellent article, the Olympic marathon turned out to be a disaster. Owing to a combination of inexperience and bad advice, Price chased hard after Scotland’s Tom Jack, who tore away at a suicidal pace and blew up after only five miles. Taking the lead in the 10th mile, Price was 200 yards ahead of his nearest pursuer by 13 miles, but the energy he had expended in running so quickly in the early stages forced him to drop out, completely exhausted, in the 15th mile. Price was not alone in his disappointment, though. To a man, the British team failed to deliver the goods, all wilting like picked flowers after setting off too quickly in the torrid heat. The first Briton home was W.T. Clarke, well down the order in 13th place, and long after the little Italian Dorando Pietri had staggered across the finishing line. Fred Hatton, writing in “The Athletic News“, commented that Price “stopped in the fifteenth mile, quite run out, and sat down, leaving Hefferon with the lead…A sudden collapse, the terrific heat of the sun, an equally strong pace were all joining forces that betokened the early retirement of the Birmingham man, spent by his own folly and lack of forethought”. With his reputation in tatters, there was only one thing for it: Price quickly immersed himself in hard training, intent on restoring his name. As a result, he was at the forefront of the marathon craze inspired by the dramatic events of the Olympic race, or the “Dorando Marathon”, as it also came to be known. Within weeks of the Olympic Games the first runners began pitting themselves against the clock over similar distances. On 31 October 1908 Price beat a field of 75 runners to win the Bristol Marathon from fellow Olympians Fred Lord and Harry Barrett, covering the 22 ½ mile course on muddy roads in 2:20:22.8. Just over six weeks later, he was back in action in the 25 miles Hastings Marathon, held on Wednesday 16 December. The Entertainments Association of Hastings had succeeded in assembling a quality field, including no fewer than five Olympians. Price started as the favourite, but the honours went to W.T. Clarke in 2:37:33.6. An untimely attack of cramp in the closing stages whilst in contention for the win saw Price slip back to finish 5th in 2:40:33. The following year, Price was nothing if not prolific in his distance-running and marathon-running endeavours, a fact which is all the more remarkable when you consider that this was a man who held down a physically demanding job in a steel mill. He had another successful cross-country season, finishing 2nd in the Midland Junior Championship, 3rd in the Midland Senior, 13th in the National; and 9th in the International at Derby, where he was, once again, a scoring member of the triumphant English team. A 15 miles road race at Cheltenham on 12 April 1909 saw him finish ahead of a good field including, notably, Olympic gold medallist Arthur Robertson, in 1:31:08. The following month Price was back in London to compete in the inaugural Polytechnic Marathon, but a strained tendon forced him to retire after lying 4th at 20 miles in 2:02:05. The injury cleared up quickly, though, and on 31 May he was fit enough to make the long trip by car to southern Wales for a 23-mile marathon race from Newport to Pontypridd. Despite the tiring overnight journey after a full day’s work, he won by over a quarter-of-a-mile from Fred Lord in 2:22:40.4. After finishing 3rd behind Jack Rimmer and Jimmy Roberts in a 15-mile road race at Blackpool on 24 July in 1:21:38, Price launched an attempt on George Dunning’s amateur 25-mile record of 2:33:44 at Stourbridge Cricket Club on Saturday 18 September. Unfortunately, Price had been suffering from neuralgia in the days beforehand, and he was not at his best. Although he kept up a record pace to 21 miles, he slowed badly in the closing stages and finished well outside the record in 2:37:35.6. Three weeks later, again at Stourbridge, Price had another go at the 25 miles record in a special race arranged by his club, Small Heath Harriers. Despite having been at work until three o’clock in the morning, Price was full of running and able to maintain a record pace, covering 10 miles in 58:05.8 and 20 miles in 2:00:03.4. However, this attempt, too, was to end in bitter diasppointment. After completing the 22nd mile in 6:49, there were still hopes of his success, but then he suddenly stepped off the track within a dozen yards of the 23 miles post to the profound disappointment of the spectators and officials His legs had gone; As he walked past the 23 miles post on his way to the dressing-room one of the timekeepers clocked him in 2:20:40, beating Len Hurst’s professional world record but 50 seconds outside George Dunning’s amatteur time. It was then that Price decided to turn professional, ostensibly to compete for the huge prize of £75 being offered to the winner of the 1910 Powderhall Marathon. It was to prove an auspicious move! After the inaugural event had led to dangerous congestion on the roads in and around Edinburgh, the second running was decided on the quarter-mile cinder track at the Powderhall Grounds on Monday 3 January 1910. The distance was, of course, the now “obligatory” 26 miles 385 yards. Despite cold and windy conditions, it was a tremendously fast race, and Price, taking the lead with a mile to go, finished like a train to win by over 200 yards in 2:40:07.5. It was the fastest time ever run by a Briton, surpassing the 2:40:28.8 made by Jimmy Roberts, of Sefton Harriers, in the Broughton Harriers Marathon on 1 May 1909. Incidentally, Price passed the 25 miles post in 2:33:43, which was one second inside the amateur record that had eluded him several months earlier. Price, always the practical one, bought a cart and a horse with his winnings and went into business as a general haulier. It enabled him to arrange his own working hours and set aside time for training and competition. On 23 July he ran another marathon at Gosforth, where he finished 2nd behind Charlie Gardiner over 26½ miles in hot weather in 2:50:30. Subsequently Price shrugged off his defeat by Gardiner, an acknowledged hot-weather specialist, by setting track records for 15 miles of 1:21:40 at Ibrox Park on 10 August and 1:21:00 at Gosforth on 10 September. 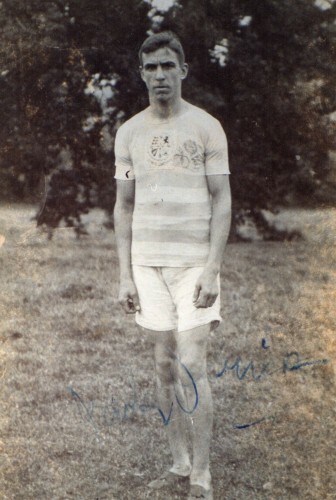 On 24 September he defeated Gardiner, although he had to give best to 1909 International Cross Country Champion Eddie Wood in a 12-mile track race at Loughton, in 1:05:08. By the time 1911 came around there were fewer competitive opportunities as the interest in marathon- running began to fade. After dropping out of the 1911 Powderhall event, Price’s only other appearance of any note was in the “World Marathon Race” at Douglas, on the Isle of Man, on 29 June. Running on a heavy grass track and in stormy weather, he clocked 2:56:09 to take 3rd behind Ireland’s Pat White and England’s James Kitchener. Price served the entire duration of the First World War in the Royal Garrison Artillery, during which time he saw heavy fighting and the usual privations. After the war he made the most improbable of comebacks when still awaiting demob, as he turned out for his unit in the 1919 Polytechnic Marathon. Here was Price, a professional, competing in possibly the most fiercely amateur event on the international racing calendar – an event which in its rules threatened to erase the winner’s name from his trophy should he ever turn professional. Be that as it may, and the special circumstances notwithstanding, Price entered the race under his proper name, and his entry was evidently accepted. After nearly five years of debilitating military service, the merit of his 6th-place finish in 3:04:59 cannot be understated. 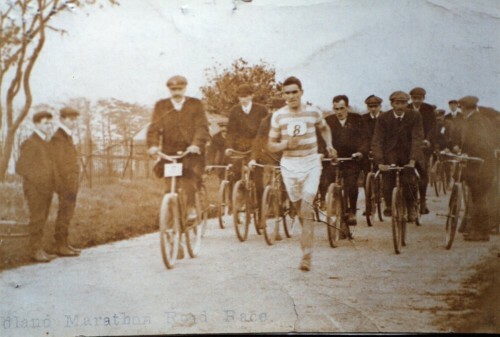 Although Jack Price continued to compete as a professional throughout the 1920s whilst coaching amateur athletes in Halesowen, the 1919 Polytechnic Marathon was to be his last race over the regulation distance. In all likelihood he stands alone as the only active professional to have ever run in that last bastion of amateurism, the legendary “Poly”. This article originally appeared in “’Track Stats”, edited by Bob Phillips, the quarterly journal of the National Union of Track Statisticians, www.nuts.org.uk.